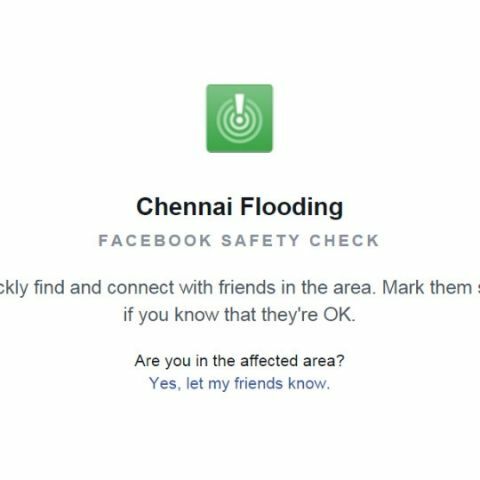 Facebook has activated its Safety Check tool for those affected by the floods in Chennai. The feature allows people mark themselves or their friends ‘safe’, and provides a way to reassure family and friends. Thousands of people are left stranded after incessant rains lashed the city and the surrounding areas, in light of which the army has also been called in to help with relief efforts. It was also announced that the Chennai International Airport will be shut till December 6. Facebook is not the only company to do its part to help out the people in Chennai in time of need. Telecom companies like BSNL will not charge its users for a week in Tamil Nadu, while Airtel, Reliance Communications and Vodafone aer providing free talktime and data for heir subscribers. Other services like Paytm are offering a Rs. 30 recharge for free for any mobile, and Zomato has started ‘Meal for Flood Relief’, where users can buy a meal for someone in Chennai, and the company will add another meal to it. Ola has tweeted that it is working with the fire department to help those who are stranded due to rains.